I have been asked how much I spend on my clothes 0_o and why I rarely wear the same outfit twice…lol I didn't answer the question about how much I spend but the wearing an outfit more then once is just not something I do. I do wear the pieces over and over but just not the same exact way as before. That question prompted me to share a few things on how you can look "expensive" for less, lol. 1. I pay for designer handbags because they will last me longer then the cheap ones and a designer bag will make your outfit look more expensive then it is. (well with some exceptions) I also don't buy knock offs because I appreciate the work and if you are trying to fool someone you are not, the people you are trying to impress are the ones who will notice that it is a fake anyway so just don't do it, save up and make the investment. 2. I pay good money for my shoes because they are more comfortable to wear then cheap ones and will last longer. SHOES CAN MAKE OR BREAK YOUR OUTFIT! So at least buy one or two pairs of designer shoes to mix in with your no brand ones. 3. I pay for GOOD jewelry because it will enhance your outfit. 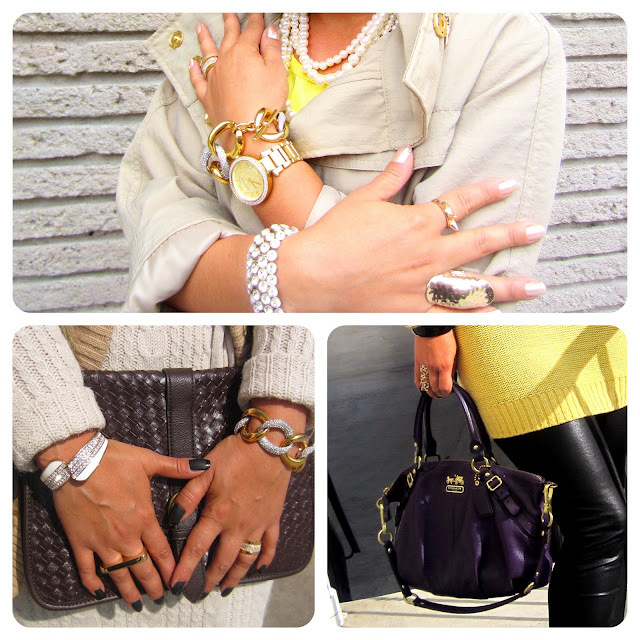 I love gold so I buy a few expensive pieces that I can mix with my costume jewelry. I mix a lot of different things when pulling an outfit together to enhance my pricey items and help make my less pricey items look better, I buy from Forever 21 often which seems to surprise some of you but you just have to know what to buy and what NOT to buy there. I can often pick up easy to wear T-shirts, tops, jeans and jewelry because I can pair it with better made items. I won't buy coats, slacks or trendy items from there because they are made REALLY BADLY which brings me to my other point. I have the luxury of being able to knock off much of the designer looks I see and want so that is a plus for us seamstresses, I won't buy a coat because I can make one better than I can afford to buy and if I fall in love with a $2500 designer coat I can make it for $200, sewing isn't always cheap (I hate when non-sewers assume it is) but it is less expensive then dishing out $2500 for a coat you could make for 1/4 of the price. Buying well made or designer items doesn't always have to be expensive, I will sniff out a sale in a heart beat and when I shop online I don't purchase without first searching for coupons so be savvy. Good advice! I agree completely on spending good money on accessories (shoes, bag) -- it really goes a long way. great advice honey yes you always look so chic and expensive love the post! Great tips! You definitely have the skills to pull all of your outfits/looks together beautifully. I am loving your manicure! Wow girl I dont honestly think I have heard anything better than that, so true, everything you said...love your site and your hourglass figure is bananas! Love this post and advice. I'm a brand junkie too which makes me a very picky shopper and not with alot of options. So I plan to follow your advice and mix it up with less expensive. Thanks a bunch for the advice.